Reaching Mysore - the city of palaces, located at the base of the Chamundi Hills, is not a problem at all. It is well-connected to all the major cities and states of India through an extensive communication network. If you plan a vacation to this place, there are various feasible options for you to choose from; according to your preference, convenience and budget. In the following lines, we have provided information on how to reach Mysore. Mysore has a functional airport at Mandakalli with very basic facilities. The airport is undergoing upgradation and expansion. Other airports located near Mysore are Bangalore Airport (140 km) and Mangalore Airport (250 km). Mysore has a railway station with in the city and is linked by rail to Bangalore and many other cities in south India. Prestigious luxury trains like Shatabdi Express and many other mails connect this station frequently. There is a very convenient network of roads and highways which connects Mysore to other important cities of the region. Mysore is about 140 km from Bangalore, 160 km from Ooty, 120 km from Hassan and 81 km from Bandipur. 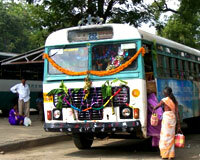 There is a regular bus service for Mysore from all the important cities of the region.